He is on a "European Tour" (Italy) during the summer 2001 with his Mambo Jazz band.The band has 17 Cuban musicians, with Augusto providing the lead vocals. 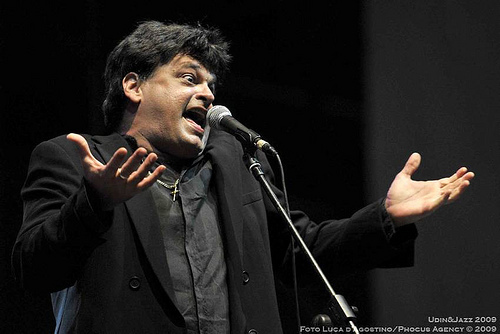 Augusto Enríquez is one Cuba's most charismatic and diverse music figures. Born in Havana, his singing career began while he was finishing his studies in medicine. Augusto was invited to join, as lead singer, the already established and popular group Moncada. From the very start, he was a national and international success. He has toured in Costa Rica, Venezuela, Chile, Peru, Ecuador, Nicaragua, USA, Canada, Switzerland, Spain, Germany and Italy. He has shared the stage with Rod Stewart, Tina Turner, Ray Charles, Dee Dee Bridgewater, Latoya Jackson, Chico Buarque, Eros Ramazotti, and Jovanotti, and made appearances with Giani Miná and Gina Lollobrigida. Nationally, he has performed with Chucho Valdés and Irakere, Omara Portuondo, Amaury Perez, Juan Formell and Los Van Van, Manolín, Isaac Delgado, Rojitas, Elena Burque, Gema 4, Zenaida Romeu, NG La Banda and many more. Augusto was the artistic director and organizer of FAO's World Food Day Concerts in October 1997. A free open-air concert took place simultaneously on stages in Rome and Havana, linked by satellite, was televised all over the world. The concert was of the highlight of more than a week of activities, dedicated to raising public awareness and support for a campaign to end chronic hunger and malnutrition, which afflicts more than 800 million people. He was the artistic director, producer and singer for all the programs aired by RAI 2 Italy on the occasion of the visit of Pope Jean Paul II to Cuba in January 1998. Augusto Enríquez, who writes the majority of his recordings, was the winner of the 1999 Qbadisco Awards. This very diversified figure of Cuba's new generation will delight the public with an evening of jazzy and very Cuban music.